For decades, the rise of machines — and what that means for humans — has been a hot topic. Pop culture, including movies, TV, and books, has made sure of that. Machine learning is a concept that has applications far and wide. Yet many haven’t heard of it, or don’t understand it, or even fear it. So what is machine learning? And why does it get such strong reactions? In this brief guide, we’ll discuss exactly what machine learning can do across a number of real life applications. And how it’s viewed across a number of different industries. In popular fiction, visions of machine learning range from dark and apocalyptic (think Terminator, The Matrix, Blade Runner) to a mixed bag of positive benefits and negative effects, (Ex Machina, WestWorld, and Black Mirror come to mind), where carefully controlled creations start to go awry. In all cases, human characters are torn between if the artificial intelligence they helped create really makes their lives better…or worse. Intelligent machines have already become an integral part of our real lives, quietly inserting themselves into our daily routines. They talk to us in our homes (think Amazon Echo and Google home), answer our random questions throughout the day (thanks, Siri), and literally help us navigate the world (praise you, GPS). But far from titanium skeletons with menacing red eyes, or human replicas with wires and microchips just below the surface, machines are invisible and yet all around us — in our smart devices, powering our Google searches, and helping us to do and achieve more than ever before. As our recently published Commerce and Digital Marketing Outlook report shows, marketers are embracing the rise of voice shopping. Fifty-seven percent of marketers think they’ll be working with voice-assisted devices (like Amazon’s Alexa or Apple’s Siri) in the next two years. Machine learning is a form of artificial intelligence that enables computers to learn without explicit programming. Instead of telling a computer everything it needs to know to complete a task, machine learning can enable a computer to essentially “figure it out for itself”, using data to learn. The more data a computer is fed, the more it learns and the smarter it gets, improving its accuracy and ability to complete tasks over time. Google Brain, Google’s artificial intelligence research project, was one of the first to successfully use machine learning to identify an object — specifically an image of a cat. 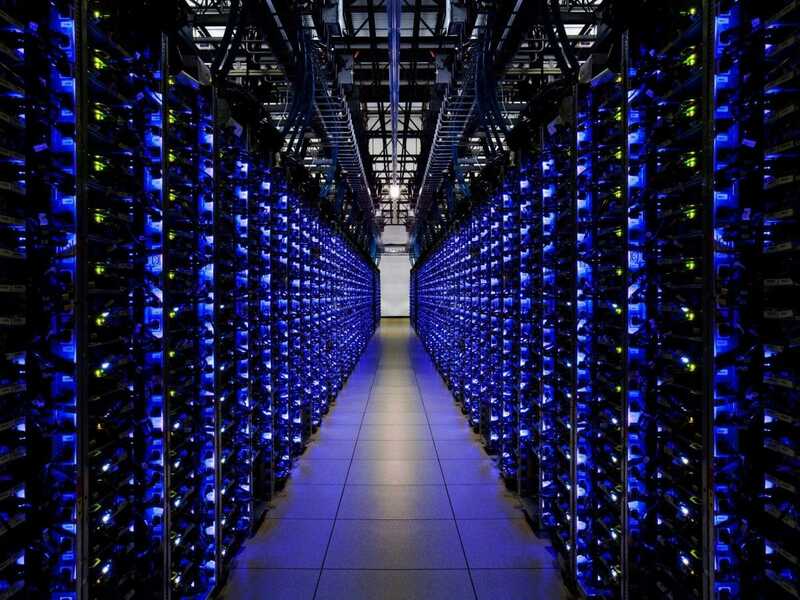 Servers inside one of Google’s data centers. Image by Google. The research team built a neural network of 16,000 computer processors and showed it 10 million random images from YouTube as a training exercise. The team then showed it 20,000 different items and found that, without being told what a cat is, the network began correctly identifying all the cat images. The important point here is that the data was unlabeled. There were no images labeled “cat”, no programs explaining what a cat looks like. The system honed in on cats without ever being told to do so. Machine learning is exciting because it makes it possible to analyze huge amounts of data and take action with a speed and precision that humans simply can’t match. Like setting bids or making trades in milliseconds…or looking at 10 million pictures and identifying which ones are cats. Successful ML requires mountains of data to “train” the system. Just as a baby learns from the world around it, an ML system learns from the data it receives. The more it gets, the more it learns. In recent years, great strides have only been possible because of new technologies and a vast amount of data collection, enabling scientists to scale up in a way that wasn’t feasible before. We partnered with IDC on a recent report covering machines and their ability to be creative. In it, we unpack how there are typically seven creative ad elements that can be personalized: images, taglines, name, formatting, color, copy, and call to action. There are multiple devices that ads must be formatted for (desktop, mobile, and tablet), thousands of publishers and ad exchanges, and more than a billion shoppers, each with their own preferences. All together, that results in trillions of possible ad variations. No human could possibly handle that level of personalization. But machine learning can. ML systems can analyze all the data we have on shoppers, combine that with specific device and publisher formatting requirements and brand guidelines, and create a totally customized ad for an individual shopper in milliseconds. Machine learning removes tedious data preparation and analysis work to free up marketing staff to work on creative ideas, fueled by a flow of relevant, real-time behavioral data. Human teams can continue to provide the foundational creative content, using machines to deliver personalized communications at scale, maximize relevancy, and drive shopper engagement.